Does Brio Wooden Railway track fit with Bigjigs rail track ? In this short article we demonstrate that Bigjigs Railwaytrack and accessories are fully compatible with Brio. Brio, from Sweden, is generally used as the yardstick for compatibility as the company was the first manufacturer of wooden railway in Europe, introducing their first sets in 1957. The name Brio has come to be synonymous with wooden railways, but now of course there are numerous manufacturers. Bigjigs Rail and Brio track pieces fit perfectly, and one brand is virtually indistinguishable from the other. Curves from both have track grooves on both sides so that the pieces can be reversed and curve left or right, whilst straights have grooves on one side only. 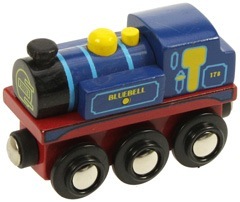 However the latest Brio track has the name “Brio” indented on the top – not always easy to see, but a touch of branding. To the left you can see both Bigjigs Rail and Brio trains on Bigjigs Rail and Brio track. The 2 left pieces are Bigjjigs rubber wood track and the 2 on the right are Brio. The rolling stock connects perfectly. We’ve checked both makes of track for smooth feel – i.e. how well it is sanded and finished – and in our opinion there’s nothing to choose between them. This inevitably also depends on the grain of the piece of wood used, but neither Bigjigs nor Brio feel rough to the touch. However Brio tend to use the more traditional beech wood for their track whilst Bigjigs Rail use rubber wood. The thinking behind Bigjigs choice is, they say, that rubber wood is less prone to cracking. 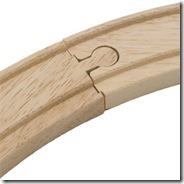 In both cases track pieces are 41 mm wide by 12 mm thick. The rail grooves are 5 mm wide, 3 mm deep with 25 mm centres, or 20 mm between them. Whilst the track is fully compatible one principal difference between the two ranges is in the engines and rolling stock. 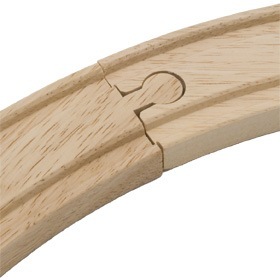 Most Bigjigs Rail items are made with a very high proportion of wood. Generally only the wheels are plastic, and detail is added through painting and printing. The Bigjigs Rail range goes as far as to include models of real old steam engines in their Heritage Collection, such as Mallard and Bluebell and other engines seen at railway museums or working on preserved lines in the UK. These make great souvenirs for children – and adults – when visiting these heritage attractions. Brio engines and wagons by contrast nowadays tend to have a greater proportion of plastic, used to give detail. This makes them consistent and means that the level of detail can be high, but they may not have as much appeal to those keen on real wooden toys. Moreover the tradition of Brio is no guarantee of European manufacture as the company moved much of its manufacturing to China about 5 years ago. Apart from these differences, the engines, carriages and wagons from each range join together through a seemingly identical, safe magnet system, so with Brio and Bigjigs Rail track also matching, Mulberry Bush can confirm, through our own testing, that these two systems are fully compatible. Great review of compatibility of BigJigs and Brio, just what I was looking for when it comes to instructing friends and family to extend my son’s ever growing rail set! !